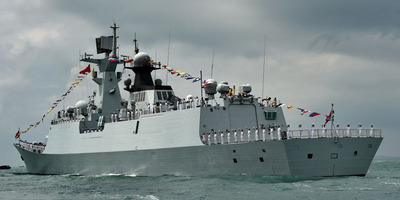 ROSLAN RAHMAN/AFP/Getty ImagesThe Chinese Navy frigate Huangshan. The project will be China’s main base for unmanned ship technology and could become the largest project of its kind. China completed its first test of unmanned surface vessels last week. China has begun building a test field for unmanned ships, according to the government-authorised site China Internet Information Center. The Wanshan Marine Test Field, which began construction on Saturday, is being built in the South China Sea off Zhuhai, which is adjacent to Macau, and not far from one of the world’s busiest shipping ports, Hong Kong. Ships will use the 225 square nautical miles to test technology including autonomous steering and obstacle avoidance. The project, which the center reported “will be the largest of its kind in [the] world” and China’s “main base” for unmanned ship technology, is a joint initiative of a number of organisations including the local Zhuhai government and Wuhan University of Technology. The university has been developing unmanned ship technology for Chinese authorities for several years. Just a week earlier, China completed its first test of unmanned surface vessels in nearby Dongguan, in the Pearl River Delta. The 22-foot vessel, developed by the Shenzhen Huazhong University of Science and Technology, performed patrols and moved in formation with other unmanned vessels. Eventually, unmanned vessels could allow China to remotely patrol and enforce its territorial claims in the South China Sea. The South China Sea is a highly contentious area high in natural resources that is also one of the world’s main shipping corridors. China, Brunei, Taiwan, Malaysia, Vietnam, and the Philippines have competing claims to areas of the sea and its islands.